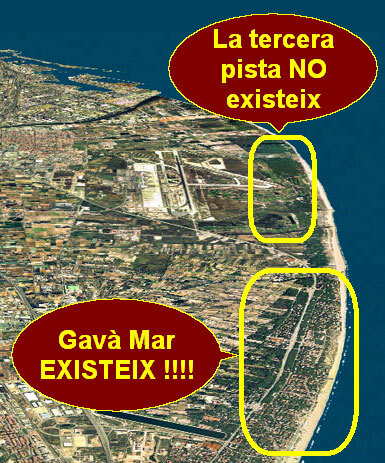 The neighbors of Gavà Mar are not against the airport. We simply want to coexist with it; the airport must be a good neighbor. This is not completely true. Until the summer of 1996 there were not many serious problems caused by the noise of planes for the neighborhood of Gavà Mar. Only a small percentage of planes that were landing flew over the neighborhood. That summer, the airport decided to change the takeoff route of the planes, in order to increase its operational capacity, and started sending them in the direction of Gavà Mar, instead of towards the sea or Zona Franca, as it was always done in the past. As a result of the demonstrations that were organized then and the action taken, we managed to get the transverse runway expanded towards the sea and the airport went back to its traditional operations from the year 1999. The problem arose again at the end of 2004 when the third runway was put into service and the new flight configuration applied. The decision of where to place the third runway (agreed upon by the 'Ministerio de Fomento' -Spanish Ministry for Infrastructures and Transportation-, the 'Generalitat de Catalunya' -Autonomous Government of Catalonia-, the City Hall of Barcelona and the City Hall of El Prat de Llobregat) was taken on July 2nd, 1998. Other proposals that minimized the impact on our neighborhood -such as the one from the Gavà Mar's Residents Association (AVV), the one from DEPANA or another one from the Chamber of Commerce- were completely ignored. The third runway was put into service on September 28th, 2004. The neighborhood of Gavà Mar has existed for more than 45 years, long before the third runway was projected. The towns of Gavà, Viladecans, Sant Boi, El Prat, Cornellà, L'Hospitalet and BARCELONA are also as close or even closer to the airport than we are. If this is the rule to be applied, then it should be applied to everybody, shouldn't it? The new areas of Gavà, Viladecans, Sant Boi, El Prat, Cornellà, and L'Hospitalet... should also have noise and it would be a normal thing, wouldn't it? There are technical solutions to this problem that have been designed by air traffic controllers and pilots, which minimize the acoustic impact on Gavà Mar. These solutions not only reduce the noise in Gavà Mar but they minimize it. This is not totally true. The Barcelona airport operates 80-85 % of the time using a West configuration. When the wind blows in a certain way, it needs to switch to an East configuration, which happens 15-20 % of the time. This last configuration entails landing in the airport flying over Gavà Mar. The parameters that indicate when to switch from one configuration to another could be adjusted, so that the use of the East configuration is significantly reduced. We do not want to sell our houses. We just want to get back the quality of life we used to have, so that we can keep on living in this place. If we wished to sell our properties we would have done it during the summer before the third runway started operating. This proposal was made by the mayors of Gavà (Dídac Pestaña) and Castelldefels (Antonio Padilla) on November 23rd, 2004, without consulting the neighbors of Gavà Mar. Gavà Mar's AVV has never proposed the destruction of a natural reserve. This is a common problem of all protests. Every demonstration (for political reasons, of taxi drivers, students, teachers, metro or bus drivers, farmers, tow truck drivers, train employees...) is always detrimental to innocent people. In any case, we try to make demonstrations not last for more than an hour, so people do not miss their flights. We wish we didn't have to protest; we really don't feel like doing it. 6,000 people live in Gavà Mar but every Saturday and Sunday all year long lots of people from the nearby towns of El Baix Llobregat come to our neighborhood to spend the day. During summertime, these visits take place every day, due to the growing quality of our beaches. If the noise problem remains the same, all these citizens from El Baix Llobregat will have to find another place to spend their spare time. Moreover, our neighboring town of Castelldefels could also end up very affected if AENA carries out with its plans.